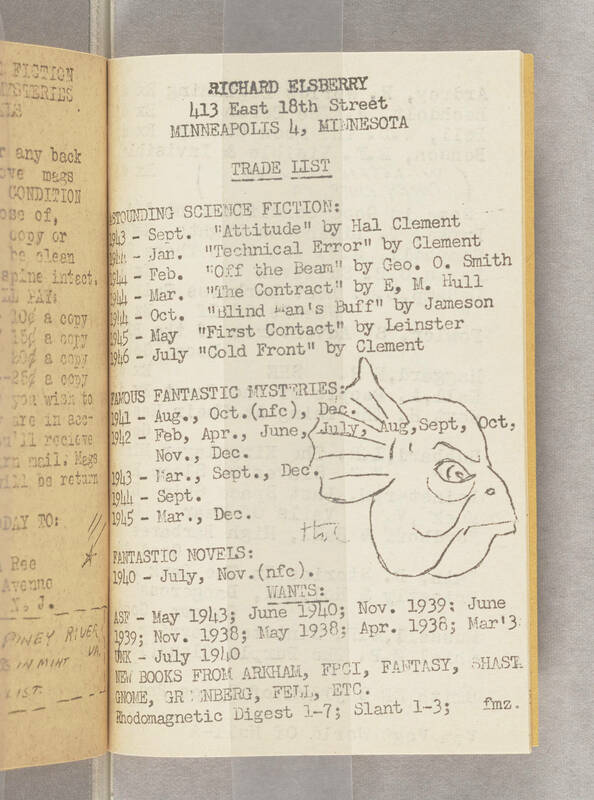 RICHARD ELSBERRY 413 East 18th Street MINNEAPOLIS 4, MINNESOTA TRADE LIST ASTOUNDING SCIENCE FICTION: 1943 - Sept. "Attitude" by Hal Clement 1944 - Jan. "Technical Error" by Clement 1944 - Feb. "Off the Beam" by Geo. O. Smith 1944 - Mar. "The Contract" by E,M. Hull 1944 - Oct. "Blind Man's Buff" by Jameson 1945 - May "First Contact" by Leinster 1946 - July "Cold Front" by Clement FAMOUS FANTASTIC MYSTERIES 1941 - Aug., Oct. (nfc), Dec. 1942 - Feb, Apr., June, July, Aug, Sept, Oct, Nov., Dec. 1943 - Mar., Sept., Dec. 1944 - Sept. 1945 - Mar., Dec. FANTASTIC NOVELS 1940 - July, Nov. (nfc). WANTS: ASF - May 1943; June 1940; Nov. 1939; June 1939; Nov. 1938; May 1938; Apr. 1938; Mar'3 UNK - July 1940 NEW BOOKS FROM ARKHAM, FPCI, FANTASY, SHAST GNOME, GREENBERG, FELL, ETC. Rhodomagnetic Digest 1-7; Slant 1-3; fmz.